Rekka overdoses on action, feels S Saraswathi. Hero-intro songs, gravity-defying stunts or romantic numbers picturized in exotic locations in a Vijay Sethupathi movie seem almost impossible to believe, given the kind of films we usually see him in. Director Rathinasiva's Rekka sees the talented actor in an all-new avatar revelling in the gimmicks of a commercial hero. The actor plays a lawyer named Shiva. Strangely, there's not a single scene where he fights a case or even wears the black coat. What he does instead is help lovers get married against the wishes of their family or save young girls from forced marriages by kidnapping them. There is, of course, a valid reason behind this strange behavior, which is explained in a lame flashback. Shiva ends up making a lot of enemies but when he stops the wedding of David (Harish Uthaman), a notorious thug, by carrying away his reluctant bride, things begin to get messy. Shiva's sister is to get married and David, who is waiting for the right opportunity, strikes back. Shiva is now blackmailed into kidnapping Bharathi (Lakshmi Menon), daughter of a powerful and corrupt politician. 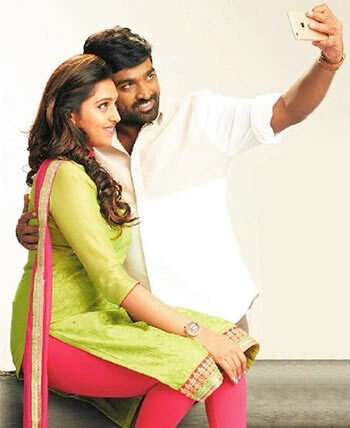 There are no prizes for guessing Vijay Sethupathi can walk away with his pretty heroine without breaking into a sweat. It matters little that hundreds of evil-looking goons are chasing him with their gleaming swords. Harish Uthaman and Kabir Duhan Singh (who made his debut in Ajith's Vedalam), as antagonists appear quite menacing but are no match for the one-man army that is Vijay Sethupathi. Vijay Sethupathi is not the only one playing an unusual role. The down-to-earth Lakshmi Menon has an equally weird character: she makes herself look like a fool and her non-stop nonsensical chatter gives you a headache. Others like director KS Ravikumar, who plays Vijay Sethupathi's doting father and comedy actor Sathish are adequate. Kishore is wasted on an insignificant role as the mentally unstable village doctor. The plot is non-existent and the screenplay lacks pace barely moving forward. Family sentiments play an important role in the film but the romance and comedy does not work. The film also overdoses on action and unnecessary build-up of the villain. Music by D Imman is too loud and dramatic highly exaggerating even ordinary scenes. Vijay Sethupathi may not make a flashy commercial hero, but when he is not sending villains flying through the air, he does give a pretty good performance. This is Vijay's sixth film this year and after a series of excellent films like Sethupathi, Dharmadurai and Aandavan Kattalai, director Rathinasiva's Rekka comes as a definite letdown.